At a recent antiques show, I saw a booth selling exclusively vintage chocolate molds. Among the hundreds on display, I noticed a few which were architecturally inspired. Cherie, co-owner of Dad’s Follies, find and sells the molds all over the world. 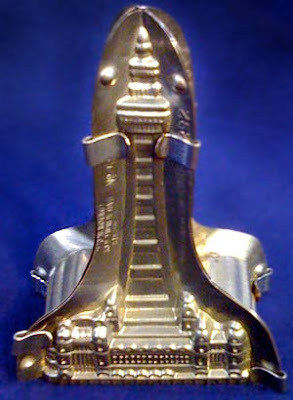 A metal Blackpool Tower mold was made by a maker named Kutzscher, which was in business from 1900-1929 in Schwarzenberg, Germany. Priced at $195.00, the mould is marked with his trade mark and the name of his agent Bart Newhill & Co. in London. The Statue of Liberty was made by Anton Reiche in Dresden, Germany. Reiche made this mould in two sizes - this is the larger version from the 1920’s. The agent mark is T.C. Weygandt & Co., New York. The price was over $5000 for this mold. We can all go to bed at night and imagine owning this mold. Sweet dreams. Check out my other posts on chocolate buildings, city bar and a sugar city. At one time I almost bought this mold at an antique store...But before I could it was gone. Having a mold of a souvenir building is something to have...not many of us have them. Yes, they seem quite rare and quite expensive. I wonder if anyone has a subset collection of building chocolate molds?